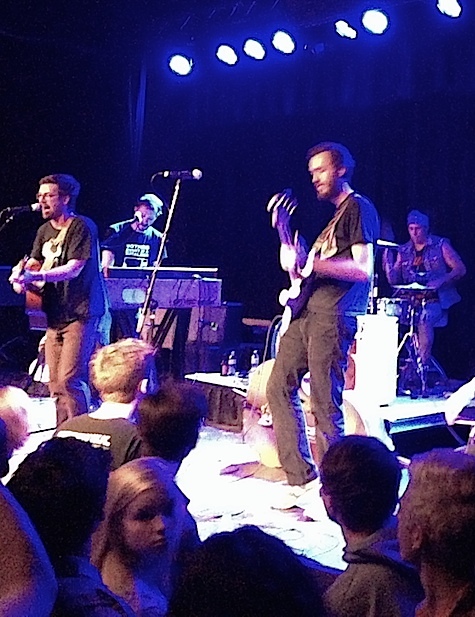 Andrew Jackson Jihad at The Waiting Room, July 15, 2014. I was converted at the Church of Andrew Jackson Jihad last night. I came in not knowing much about the band other than what I briefly heard off the interweb. My initial comparisons were pretty straight on, though I missed the band’s biggest resemblance (or influence): The Mountain Goats. Frontman Sean Bonnette is a desperate, anxious, scared version of John Darnielle singing not about some mythic, drunken aging couple but (presumably) about a loser/loner celebrating a loneliness that the 150+ crowd at The Waiting Room last night could identify with and revel in. It was, indeed, a party atmosphere that (based on the band’s comments from stage) almost got out of hand. On recordings, AJJ is a lyrically driven acoustic-powered dynamo. They ramp up their sound live with plenty (too much) low end, plus electric guitar and keyboard, turning into something that more closely resembles Decemberists. Unlike Mountain Goats’ galloping 3/4 time shanties, AJJ’s ballads are straight-four rattlers that earn them their folk-punk designation. The wooden-sounding cello gave a handful of songs an earthy flair. Frontman Bonnette is a friendly muppet confessing to every vice and ill life has thrown at him with a smile and perfect enunciation. This would just be another run-of-the-mill indie folk band if you couldn’t understand every word of his clever, joyful confessions. And it was fun watching a guy standing alone well back from the stage mouth every word to every song. No doubt these celebrations of despair meant something wholly different to a newer generation. The young-ish crowd on hand last night (I recognized no one except the TWR staff) responded to the dark elegies with an unbridled YOLO-ish spirit. Despair, I spit in your face! Isolated slam-dancing, crowd-surfing and synchronized crowd sway were the norm. My reaction as someone old enough to be their father was slightly different. Pained lyrics like, “Love what you can ’til it dies / Then let it lie, let it fly away” hit a little too close to home, and I found myself more bummed and introspective than when I listen to the usual punk-rock fist-pumpers. All I could think of while I was watching the happy spectacle during songs like “Heartilation,” with lines like “Sometimes I get so lonesome I can’t breathe / Sometimes I get so scared I can’t speak,” was Go ahead and laugh, for as HST used to say, it’s later than you think. Tonight at The Waiting Room LA band Bad Suns (Vagrant) with Colony House (Descendant Records). $10, 9 p.m.